Even if there is a liberation of the spelling of foreign surnames, it will only influence the mixed marriages in which one of the spouses is a foreigner. However, the Poles who live in Lithuania can not count on the statutory consent for spelling of their names in the original version. Such conclusions can be made from the discussion which took place on the conference “The spelling of first and last names – challenges and decisions” which was organized by the European Foundation of Human Rights. However, according to the representatives of the foundation that would be the first step towards solving the problem concerning the spelling of names of the Lithuanian Poles. It has already been a couple of parliamentary sessions but the ministers can not reach an agreement regarding the registered drafts of bills, which would ration the spelling of the first and last names in their original version. Regardless of the decision of The State Commission of the Lithuanian Language and alternative drafts of laws, the lawmaker have not voiced the definite will. Meanwhile, the Lithuanian courts are viewing the spelling of first and last names considering the deeds of European Union and the European Court of Human Rights. During the conference “The spelling of first and last names – challenges and decisions” the representatives of EFHR presented the newest practices of the courts regarding the spelling of first and last names. The District Court of Vilnius has already obliged the registry office of Vilnius to include in acts of the registry office the letter “w”. A few cases are still waiting for the decisions of the courts. Ewelina Baliko, an attorney of the European Foundation of Human Rights, in a conversation with Wilnoteka said that there are hundreds of cases in which the citizens of Lithuania have their names in the documents spelled with letters “w”, “x” or double “n”. However, if somebody asks the registry office to include non-Lithuanian letters in their first or last name, the office will not allow that. “Each week, there are two or three people who ask our foundation what to do in such case. The only way is to initiate legal proceedings. For example, the family of Wardyns currently has six legal cases regarding the change of names: Małgorzata Runiewicz-Wardyn seeks for a change in the marriage certificate and in the passport, the parents also seek for changes in their children’s birth certificates and passports” – said Ewelina Baliko. Roman Gorecki-Mickiewicz – a great-grandson of Adam Mickiewicz also fights for his rights in court. He seeks a change in his daughter’s passport. She has Lithuanian citizenship and he wants her passport to have the letters “x” and “w” included. “My daughter Alexa had a Lithuanian passport with the surname spelled in the original version. However, when the document was about to become invalid, the registry office denied issuing a new document with the same spelling. Their excuse was that the letters “x” and “w” are not present in the Lithuanian alphabet. That is strange, like we did not have Maxima(chain shop) in Lithuania or Swedbank” – about the situation in which his family is spoke Roman Gorecki-Mickiewicz. He also pointed out that the right to use the original spelling of names must be given not only to spouses of foreigners but also to the minorities. According to Roman Gorecki-Mickiewicz, the politicians are not willing to solve the problem of the original spelling of names. 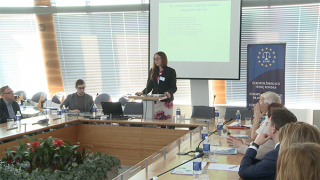 The representatives of the State Commission of the Lithuanian Language who took part in the conference commented on the reported by the linguists opinions of drafts of laws regarding the spelling of names. As it was pointed out by Jūratė Palionytė – vice-chairwoman of the Commission, the mentioned drafts concern only the citizens of Lithuania who have a foreign spouse and children. Three cases are waiting to be processed in the parliament: on of them was prepared by the social democrats, the second one by the conservatives and the third one – the newest – was reported in autumn 2015 by a group of citizens. None of them – even if accepted – does not solve the problem of the original spelling of names of the Poles who live in Lithuania. The attorney of EFHR, Ewelina Baliko, thinks that accepting any of the versions of the draft would be the first step to validation of the original spelling of names of minorities, including Poles, in the future.